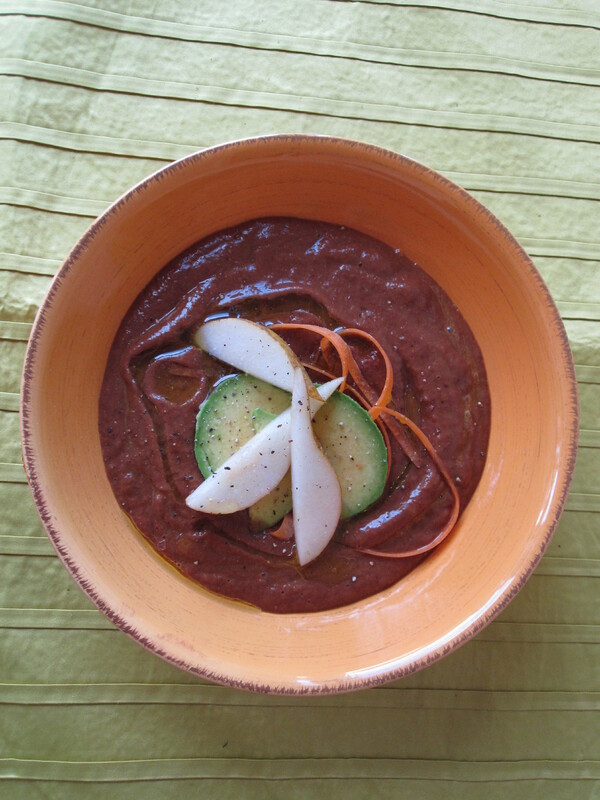 For this recipe I have used a mixture of purple and orange carrots, so we ended up with quite an interesting ‘brownish’ coloured soup. Didn’t affect the tastiness of this rich thick soup though. This is a great Autumn soup as all these ingredients are freshly available at the supermarket in Autumn and preparing the soup reminds me of all the colours of Autumn leaves – including the brown leaves. Yummy and full of wholesome goodness. Combine all ingredients in a blender. Blend for five 1 minute intervals until the mixture is pureed. To warm soup place in dehydrator 15 minutes or serve into pre warmed bowls. Garnish with chopped avocado, pear and shavings of carrot and a drizzle of olive oil. A wonderful warming Autumn soup.